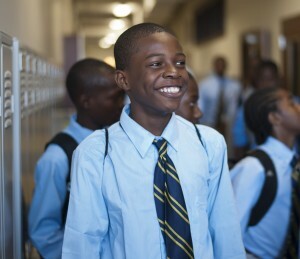 Mission: Chicago Jesuit Academy (CJA) is a full-scholarship lower and middle school for young men from modest economic backgrounds who could not otherwise access a well-resourced, faith-based college prep education in the Catholic tradition. We support and advocate for CJA students and alumni as well as other children of modest means as they progress to and through college prep high schools, post-secondary education and the transition to meaningful careers and citizenship. CJA invites students to become persons for others who aspire to be open to growth, loving, intellectually competent, religious and committed to doing justice. Means: Located in the Austin neighborhood on Chicago’s West Side, CJA enrolls students without regard for their past levels of academic achievement. We use small class sizes, rigorous extended school days and an 11-month school year to develop each student as a whole person in accord with the Jesuit mission and tradition. CJA shares best practices with other schools, and we partner with the broader community to promote access to better educational resources and a deeper understanding of the obstacles to educational equity. The disciplined sacrifices of CJA’s students, alumni, parents, faculty, staff, volunteers and benefactors make the success of our mission possible.